www.activedinc.com/actived ■Retail Price: Individual classroom licenses start at $199; school-wide licenses are $999. District-wide quotes are available upon request. Walkabouts is an online platform that lets teachers create guided lessons for grades Pre-K through 2 that activate academic content with movement. Quality and Effectiveness: Based on a simple concept, Walkabouts is an “active learning platform” that offers a unique way for students to incorporate physical movement with standards-based math and reading activities in grades Pre-K – 2. Before the lesson begins, correlations display below the player window. Walkabouts is correlated to state standards as well as Head Start and NAEYC standards (coming soon). In addition, correlations display for differentiated instruction. As they create lessons, teachers have tools available for immediate assessments or can have them sent to their email for use with handheld devices. Additionally, teachers can download PDF worksheets with physical movement warmups to reinforce or support instruction. As the program progresses, each time a student plays a Walkabout, the content will change so that students are newly motivated for each lesson. Ease of Use: A top characteristic of this program is its ease of use. Everything is at your fingertips to just click and select. With their individual dashboards, teachers and students can easily choose options for their work. For teachers, grade levels and topics are in a drop-down menu so that they are easy to select and match. Teachers can set up individual students or teams to participate in the lesson as well as build a list of favorites. Requested movements are simple to use, not disruptive to class, and done as part of the chosen video lesson or the review PDFs (e.g., “hands on hips and twist if this is the middle of the story.”) This program is easy to use for all learning styles in class, team, or individual configurations, during or before/after school, or at home. Teachers can assign Walkabouts to students for completion at home or in the classroom. Creative Use of Technology: This platform uses research-based information to guide its progress. “Walkabouts are online, on-demand activities that bring educational standards to life with fun-friendly movement.” It is an intriguing use of active movement while learning standard ELA/literacy and math grade-level concepts on videos. The videos are available in school as well as for home and other programs. Easily chosen Walksheets (printable PDF worksheets) are available from scroll-down menus to support each Walkabout. Suitability for Use in a School Environment: Teachers will find it easy to choose grade level, subject, and Walkabouts in the program for set-up in any configuration. The program is easily integrated into the classroom but also available for individual classroom work and/or at home. Assessments are connected to lessons for data evaluations with access in classrooms or on portable devices. New content is continually added to the program. Simple, one-page, illustrated PDFs are available to explain the roles of teacher, student, and parents. 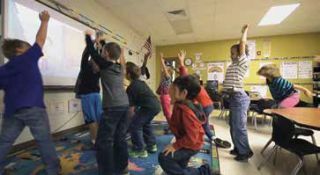 • Integration of physical movement with standards-based lessons for Pre-K-Grade 2. • Research-based (available online for prospective buyers). • Program available for whole class, individual, or teams for group work or stations.